By Venture Planning Associates. Used by permission. Some VC firms form venture capital keiretsu, loosely formed blocks of firms that invest together. In pursuit of high returns, a venture capital ("VC") firm raises a fund of anywhere from $10 million to $350 million in size for their first fund. Later these funds may grow to the billion dollar size and above. The legal structure of a VC fund is a limited partnership, limited liability company or limited liability partnership. Those who invest money into the fund are known as limited partners (LPs). Those who invest the fund's money in developing companies, the venture capitalists, are known as general partners (GPs). Generally, the LPs contribute 99% of the committed capital of the fund while the GPs contribute 1% of it. As returns are made on the fund's investments, committed capital is distributed back to the partners in the same percentage. VC firms receive compensation for their investment and management activities in two ways. First, they receive an annual management fee paid by the fund to a management corporation which employs the venture capitalists and their support staff. The annual management fee approximates 2.5% of committed capital; however, it is usually lower at the very beginning and end of the fund when investment activity is low. Secondly, the VC firm receives compensation through the allocation of the net income of the fund. The fund's primary source of net income is capital gains from the sale or distribution of stock of the companies in which it invests. The GPs typically receives 20% of net capital gains while the LPs receive 80%. 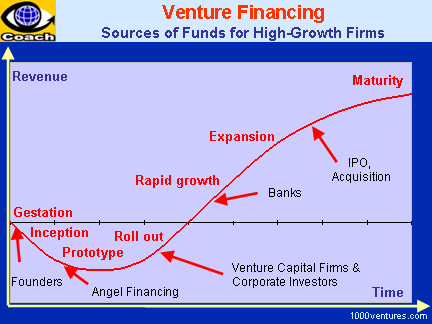 A venture capital fund passes through four stages of development that lasts for a total of ten years. The first stage is fundraising. It typically takes the GPs of a venture fund six months to a year to obtain capital commitments from its LPs. LPs include state and corporate pensions funds, public and private endowments, and personal investors. The third stage, which lasts until the closing of the fund, is helping portfolio companies grow. The portfolio company and the VC firm unite to form a team whose goal is to increase the value of the portfolio company. 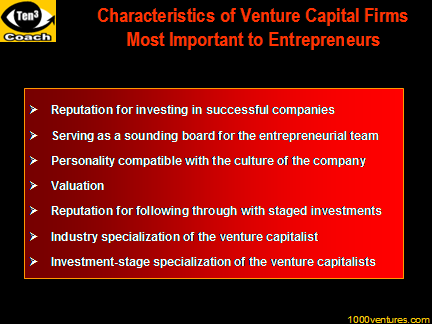 In return, the VC firm provides financing and a representative who sits on the portfolio company's board. As a board member, the VC representative offers strategic advice to the → management team and assures that his/her firm's interests are considered.